Johnny Depp made a surprise appearance at San Diego Comic-Con yesterday during the Fantastic Beasts: The Crimes of Grindelwald portion of Warner Bros.' panel in character as the evil wizard Grindelwald. For the majority of the presentation for the highly-anticipated wizarding world sequel, Johnny Depp wasn't on stage and most in the crowd assumed that he simply was too busy to turn up at the event. However, toward the end of the showcase, he walked out on stage in full Grindelwald gear and delivered a speech in character. Not only did we get a fantastic Fantastic Beasts 2 Comic-Con trailer, we also got this unforgettable moment in Hall H. The speech delivered by Johnny Depp focuses on the "good of humanity." But really, it's just a classic villain's point of view monologue, ultimately about how a lot of people are going to suffer for what he perceives to be the greater good. 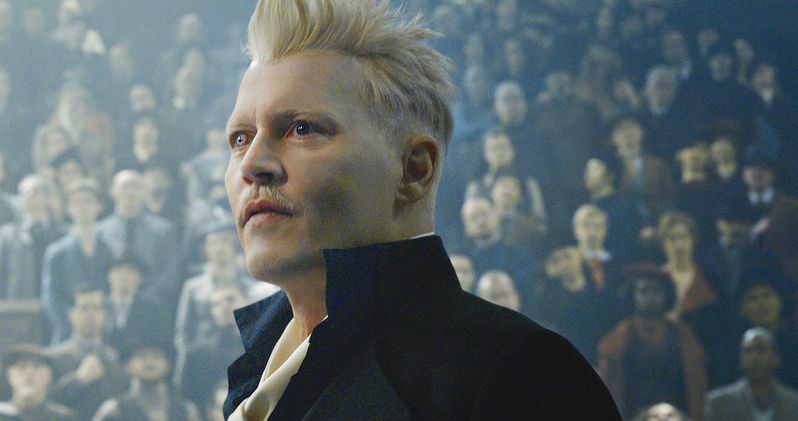 Depp wasn't revealed until the very end of the first movie, but that set him up to be a major part of Fantastic Beasts: The Crimes of Grindelwald and, in all likelihood, a fixture of future movies in the planned-five movie franchise. Warner Bros. also revealed a brand new trailer for the movie during the SDCC panel which was simultaneously released online. This appearance by Johnny Depp at the convention is notable for a few reasons. For one, his casting has been subject to some controversy, given his alleged misconduct and abuse to his former wife Amber Heard. J.K. Rowling has come out in defense of his casting. As it happens, Heard was also backstage and came out on stage not all that much later to help promote Aquaman, which closed out Warner Bros.' panel. This did not go unnoticed but, there was no confrontation between the two, as far as we know. Prior to his appearance on stage, several people on Twitter noted that Depp was booed when he appeared on screen by some people in the audience. But that worked in his favor, since he is playing the villain. Fantastic Beasts: The Crimes of Grindelwald arrives in theaters on November 21. The movie sees an effort to thwart Grindelwald's plans by a (relatively) young Albus Dumbledore, who enlists his former student Newt Scamander, who agrees to help, unaware of the dangers that lie ahead. Lines are drawn as love and loyalty are tested, even among the truest friends and family, in an increasingly divided wizarding world. David Yates, who helmed the last four Harry Potter movies and the first Fantastic Beasts, is back in the director's chair, working from a script written by J.K. Rowling herself. The first Fantastic Beasts was released in 2016 and went on to find great success, grossing $814 million at the global box office and paving the way for the upcoming sequel. The cast includes Eddie Redmayne, Katherine Waterston, Dan Fogler, Alison Sudol, Ezra Miller, Jude Law, Zoe Kravitz, Callum Turner, Claudia Kim, William Nadylam, Kevin Guthrie, Carmen Ejogo, and Poppy Corby-Tuech, in addition to Johnny Depp as Grindelwald. You can check out a video of Depp from SDCC during the Warner Bros. panel for yourself below.